Voile is usually thought of as simply a wedding and special event fabric. It is sheer, soft and floaty. But it actually can be used quite effectively in tours as well. 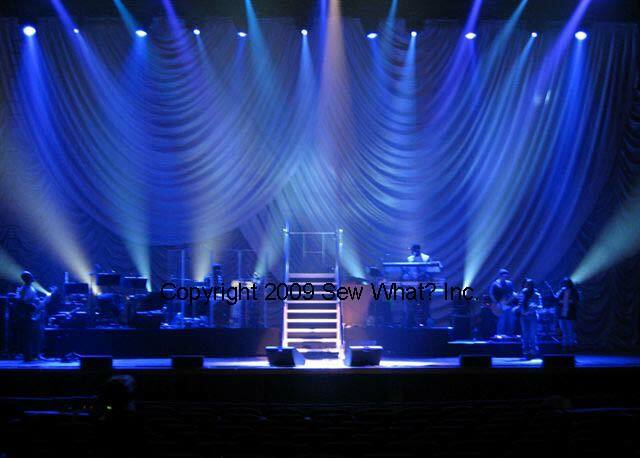 For Rod Stewart’s 2008 tour, we made a series of gorgeous 200% fullness pleated voile drapes. With the entire set design focused on the drapes, they were particularly dramatic, especially with lighting effects that made the drapes appear different colors throughout the show. Logically, it is hard to imagine being able to use white voile, a sheer fabric, to project lights and images on. You would think that the projection would go right through the fabric. Surprisingly enough, voile can actually be a very effective material for projection, if properly lit. Recently, we worked on soft goods for the Beyonce Tour and, although she mostly used Black Encore masking drapes for this tour, we did make a 24′ h x 56′ w White Voile Projection Drape. This was a fun gag. The drape was made with 7′ high slits every ten feet or so, which allowed the dancers to “pop” out from backstage through the drape. Throughout the routine, different images are projected onto the voile to serve as a backdrop to the dancers. It makes for a great effect, as you can see on this video. So, while the tendency is to think of voile as simply a wedding and special event fabric, it is actually quite versatile. Production designers, keep voile in mind the next time you are looking for a different look for a tour you’re designing. Thinking about replacing those old, tattered drapes in your school auditorium or community center stage with beautiful new custom stage curtains, but not sure where to start? It can seem like a daunting proposition, especially for a school parent or church volunteer with no background in the theatre. 1) Figure out the approximate size that you will need, based on the size of the existing curtains. Check for a label to see if the height and width are listed. If not, measure the existing drapes. To measure width for pleated drapes, measuring along the top edge generally gives a more accurate measurement than measuring along the bottom hem. 2) Determine the top, bottom and side finishes used on the existing drapes. For the side hems, simply measure the size of the turnback on the back of each side of the drape. 3) Determine the fullness used in pleating. You don’t have to figure it out exactly, just have a rough idea. 4) Consider your fabric options. Generally, theatrical velours or similar fabrics are used for traditional stage curtains. However, within that category, there are many different options to suit your budget and your taste. Need help? Just give us a call. We can give you more information, make suggestions, even send fabric samples. Taking the tour to Europe? Think about flame retardancy now! It used to be that tours would have two sets of drapes – one for the US leg of the tour and another for Europe. These days, many tours are becoming more budget conscious and are choosing to purchase a single set of drapery and soft goods. One thing to keep in mind when considering this option is the issue of flame retardancy. The requirements and regulations regarding flame retardancy of hanging drapery are quite different between the US and Europe. Just because a fabric passes US standards doesn’t mean it will pass European standards, and vice versa. It is especially difficult because there is no single European standard – Germany, France, and the UK all have their own standards. Does that mean you can’t get custom stage curtains, scrims, band backdrops, stage skirting, etc., in the US and then use them in Europe as well? Certainly not. But what it does mean is that you need to plan ahead. Let us know that you will be using the drapes in Europe as well as the US. We can recommend fabrics that have previously been shown to pass both US & European standards. Another idea – contact the European venues for each stop on the tour and ask if there is a process you can go through in advance to get your drapes approved for that venue, such as sending burn samples to the venue or contracting with a company in that country for pre-testing and certification. The most important thing? Do your homework before the tour heads to Europe. The last thing you want is to find yourself standing in a venue in London or Berlin the morning of the show, being told you can’t use your drapes! Because the terms “backdrop,” “cyc” and “scrim” are often used interchangeably, it can get confusing to understand what each term really refers to in the theatre. Even I still get confused occasionally and have to stop and think for a minute (it’s been a long time since my days as a high school theatre nerd) – and so I thought there are probably a lot of folks out there who would like a quick rundown on the differences between these pieces. A Cyclorama (or “cyc”) refers to a white or natural seamless flat muslin panel. It is always the piece that is hung furthest upstage (aka at the very back of the stage) and is usually used for sky effects (often through frontlit projection). A Scrim is made from a very specific type of netting called Sharkstooth Scrim. Depending on lighting techniques used, its appearance varies from opaque to translucent. It is nearly always seamless and can be hung in various locations on stage. A Painter’s Backdrop is a white or natural flat muslin panel (seamed or seamless) that is used in various locations onstage to help create the scene. Often the scene is painted on (hence the name) – either by the stage crew or by a professional scenic painter. Other times, the scene is projected onto the painter’s backdrop. Alternatively, to create a similar effect, a digitally printed backdrop can be used rather than a painter’s backdrop. And “backdrop”? Well, it is just a generic term for something (usually a drape of some sort) that is behind something else – such as behind the orchestra at the Philharmonic or behind the President during a press conference. It could be muslin, it could be velour, it could be another material. It could be flat, it could be pleated. Pretty much, the sky’s the limit. Hope this helps. And keep in mind, if you aren’t sure of what to call something – not to worry. You can always call us and describe what you need – we can help you out. Silver Satin – What an incredible fabric for lighting! I am amazed at how beautiful and different silver satin can look depending on how it is lit on stage. I have seen it look so many different colors, depending on the lighting effects, from the original silver to pink, red, blue…it seems that the possibilities are endless. We’ve made a number of custom drapes from silver satin over the last couple of years, and every time I look at a photo or video of one of them on stage, I see a new color. When John Mayer performed at the Nokia Theatre, the same silver satin Austrian appears blue/purple in one video and red/pink in another (all in one show). We’ve also made a number of silver satin pieces for our sister company, Rent What? , for their “Silver Satin Series,” including austrians, legs, borders, and swags, and Rent What? has found them quite popular for the rental market. Carrie Underwood used silver satin legs from Rent What? as a backdrop to her performance on the Academy of Country Music Awards broadcast recently, and, due to clever lighting, they appear red – check out the video. Currently on tour from the Rent What? Silver Satin Series are several swags, used by Jennifer Hudson in her tour with Robin Thicke. Looking at this picture, you would never know that the swags are actually silver. I think this is a great fabric for so many uses. Yes, it looks great on music tours, but it can also be used by schools, churches, dance troupes, and so much more. On a day to day basis, there is a beautiful silver drape. In a show, with the right lights, suddenly you have a red drape or a blue drape or…It’s almost like getting several drapes for the price of one!